Thank you for your service! The University of Kentucky has a long history of educating and training our military members as well as its leaders. We are proud of that mission that continues today with our Reserve Officer Training Programs. We appreciate the commitment required to serve in uniform and feel honored to have been a part of that preparation. UK recognizes that commitment and sacrifice in a variety of ways. Our iconic Memorial Hall was dedicated to the fallen of WWI and our Memorial Coliseum to those who gave all in WWII and subsequent conflicts to include Iraq and Afghanistan. Recently the University of Kentucky became the first institution of higher learning to sponsor an Honor Flight. Seventy veterans along with their guardians, many of whom were also veterans were taken to Washington D.C. on Armed Forces Day, May 20th, 2017 to see their memorials. For most this was the first time seeing their memorial. For others, it was the heartfelt receptions in Washington and back home that made the trip special. If you are interested in supporting our student veterans, please contact the UK Student Veterans Association. Thank you again for your service and your continued support of our student veterans here at UK. 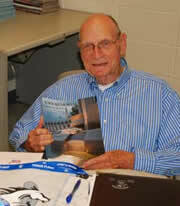 Mr. Henry S. Spencer, Sr., Auditor at UK's Division of Regulatory Services, is a World War II Veteran. He served with the 1st Marine Division, U.S. Marine Corps, in the Southwest Pacific Theatre of WW II. In October 2010, Mr. Spencer participated in a visit to Washington, DC with the Bluegrass Chapter of the Honor Flight Network. This organization is a non-profit group, based in Louisville, KY, created to honor America's veterans. A group of about 40 veterans from the Lexington area flew out of Louisville and visited the National World War II Memorial, the Korean Memorial, and the Marine Corps War Memorial, known as the Iwo Jima Memorial. It was a full day for the tour, which was a 'thank you' for the veterans' service. "I felt honored to make this trip and was proud to be a part of this group of veterans" said Mr. Spencer. He also was impressed with the caring attitude and compassion shown along the trip at the Louisville and Baltimore airports and in Washington, DC at the National Memorials. Mr. Spencer received a Bluegrass Chapter tee shirt, ticket and ID holder, a personal note of thanks, a memorial booklet with facts and pictures, and many memories from his trip. Mr. Spencer also received his commission as an Honorable Kentucky Colonel during this trip, becoming Colonel Spencer. We are honored to have Mr. Spencer in our Department. I have enjoyed talking with him about his trip to the Memorials and the time he spent in the armed services of our nation. His action included the Battle of Guadalcanal ('42-'43), the Battle of Cape Gloucester (New Britain, '44), and the Battle of Peleliu ('44). Mr. Spencer's name appears in the National WW II Registry of Remembrances.